Driving and vision – are you safe? Car drivers (group 1) must be able to read a car number plate from 20 meters. You also need to be able read the 6/12 line of letters on an optometrists Snellen chart using both eyes together or, if you only have sight in one eye only, in that eye. Lorry and bus drivers (group 2) must meet more stringent eyesight requirements, with a medical and vision check when they first apply for their licence, and then every five years from age 45 and every year from age 60. You can test yourself by reading a car number plate from 20 meters. You should check this yourself regularly. When checking vision, the number plate should be from a car made after 1st September 2001 since the size of plates changed at that time. Spectacles or contact lenses should be worn, if necessary. We will check your vision on a Snellen chart during an eye examination. You must tell the Driver and Vehicle Licensing Agency (DVLA) about certain eye or general medical conditions. The most common conditions (but not the only ones) are age-related macular degeneration, cataracts, glaucoma and diabetic retinopathy. If you are a group 1 driver, you must tell the DVLA if you have a medical condition affecting both eyes, including different conditions in each eye. If you are a group 2 driver, you must tell the DVLA if you have a medical condition affecting either eye. The DVLA may then send you for a field-of-vision test in which lights are flashed in the edge of your vision. People are generally poor at judging their own field of vision, and blind spots in your vision create a risk of accidents, especially involving pedestrians. An eye examination carried out at D J Dunstone will always include a visual field test, to sensitively check your peripheral vision. We are also able to offer an Esterman visual field test (as used by the DVLA) which is performed binocularly (with both eyes simultaneously). You should see your optometrist who will be able to tell you if you need a new spectacle prescription, whether you need to be referred to an ophthalmologist (eye doctor), or if you have a condition that should be declared to the DVLA. It is wise to attend for regular eye examination even if you are not having problems with your sight, as eye and general health problems can often be detected at an early stage. If spectacles are required for distance, modern lenses are available from D J Dunstone to optimise vision for the dynamic task of driving. 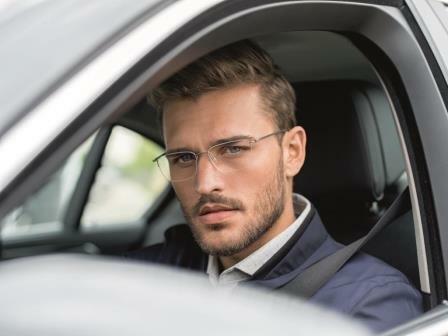 Rodenstock ‘Road’ lenses are designed to sharpen drivers vision and reduce peripheral distortion to give good all-round vision. ‘Road’ lenses are available in single vision distance or varifocal form and perform just as well in every other way yet offer optimised vision for driving. Click here for more information about ‘Road’ lenses. Please contact us to find out more or if you would like to consider ordering a pair. You are welcome to attend D J Dunstone Optometry at 3 Queen Street in Hadleigh if you have any queries regarding your vision or are due a routine eye examination. Please telephone 01473 823755 to discuss your requirements or make an appointment.